Grandad showed Junior the triode that he had kept. "You can see the wording on it if you look carefully," he said. "It says 'REPAIRED BY RADIONS LTD' on the glass," read Junior. "And if I look closely I can see the insides through the coloured glass. There's the cylinder that is the Anode, the wire coil that makes the Grid, and I think I can see the filament. It looks a bit like an upside-down letter 'V'. And that spiky bit on the top must be where it was sealed to keep the vacuum in." "That's right", said Grandad, "It was the first type of valve to have a filament like that. The earlier valves usually had the anode tube going from side to side and just had one wire for the filament, that went from side to side in the space. With those, it was difficult to stop the wire sagging as it got hot. It could droop downwards into the grid, and stop the valve working, which wasn't very useful. "This valve has a 'V' shaped filament with the 'V' upside down. A bit of spring wire held the top safely, as well as keeping tension on it to stop any sagging. The anode tube was upright, which helped as well. "The glass 'pip' at the top is the seal, which in later valves was at the bottom instead, so that it was safely protected by the base. Then, in the 'fifties, miniature valves with no base were made and the pip went back on top!" "Why is the glass that orange colour?" asked Junior. "I've never seen a valve that colour before!" "The colour comes from the getter in the valve," said Grandad. "The getter is used to 'get' the last trace of gases such as oxygen and nitrogen out of the valve, so that it has a better vacuum and works properly. In old valves like this, they used red phosphorus. A bit is put on the inside of the valve, and after almost all the air has been pumped out and the glass 'pip' sealed up, the whole valve is made very hot. This drives all the gas out of the glass and metal bits, and at the same time causes the phosphorus to vapourise. The phosphorus vapour reacts chemically with the gases and combines with them, so that they no longer spoil the vacuum. As the valve cools down, most of the phosphorus settles on the inside of the glass bulb, giving it that rather pleasant colour." "So why aren't modern valves orange?" asked Junior. "Later valves use magnesium as a getter," replied Grandad. "A small pellet of magnesium is fixed inside the valve, then it is all heated using an induction coil to make the insides red hot, when the magnesium evaporates, like the phosphorus did. Some of the magnesium vapour absorbs the oxygen and nitrogen, and what is left usually settles in a patch on the glass, making it look like a little silvery mirror. If the glass bulb breaks or cracks and air gets inside, the shiny film of magnesium oxidises and goes milky white in colour. A valve that looks like that is always a dud." "So who are these RADIONS people, then?" asked Junior. "Ask, ask, ask; always questions!" groaned Grandad. "Radion's was from Bollington in Cheshire. In the 'twenties, around 1923, they started a business repairing faulty valves. The old valves, like mine, are known as 'bright emitters' because the filament glows brightly, like a lamp, when they are in use. It quite soon melts or snaps and the valve stops working, of course. Radion's bought these faulty valves, replaced the filament, re-evacuated and sealed the bulb, then sold the repaired valve more cheaply than a new one. In later years they made their own valves, but they stopped this business around 1930, when other valve makers were selling new valves more cheaply. 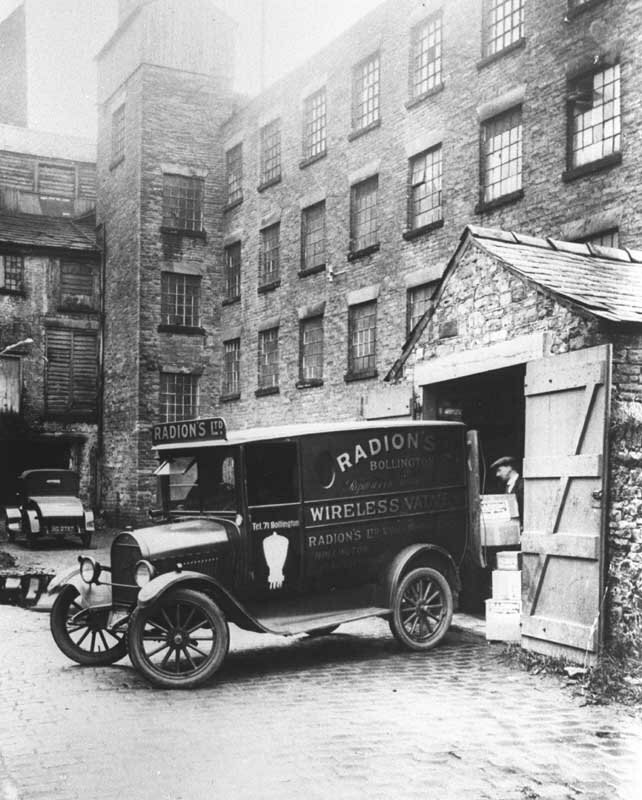 "I found this picture of their workshop at Higher Mills in Bollington - they only used a part of the building! It has all been demolished now and become a housing area"
"Coo! I like their old van!" said Junior.